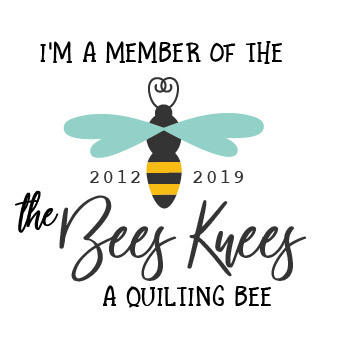 The Bees Knees - A Quilting Bee: True North - Finished Quilt!!! True North - Finished Quilt!!! A huge Thank You to all of you that made a True North block for me last year!!! I finally got it quilted up and bound and I just love, love, love it!!! I have wanted to remake this quilt in something other than Christmas fabric for so long and it would not have happened with all of you!!! You are the greatest!!! And I even got to make a cute pieced back with the extra two blocks you made!!! How fun is that!!! This is now the cover quilt on my pattern and I am thrilled about that!!! And as a special thank you, you will be getting an email with the newly updated PDF True North pattern. Thank you all for helping me get this off the To Do list and adding it to the Done and Done list!! !